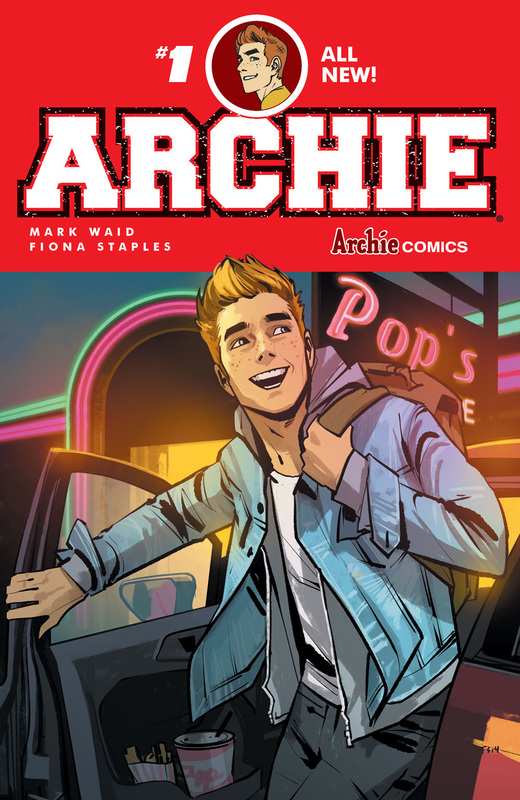 In one of the most anticipated reboots in comics to come in years, Archie Comics has reimagined their legendary pop culture icon, Archie, with a brand new series. And who better to be the caretaker of such a national institution but prolific veteran comic book writer Mark Waid and the award-winning artist of the smash hit Saga, Fiona Staples. They've updated the 75-year old symbol of campy teenage hijinks but maintained the endearing spirit that have made the Riverdale gang an American classic. Waid is no stranger to putting his own spin on long-established characters. The Eisner-award winner has had acclaimed runs on Daredevil, Fantastic Four, The Flash, Superman, and many more. Archie Andrews and the kids of Riverdale represent a unique challenge because, unlike superheroes with their world-altering calamities and larger-than-life villains, the drama in high school is much smaller but no less important. Archie breaks the fourth wall, welcoming the reader to Riverdale. It's a clever introduction for new and old fans to see the charming innocence of Archie draw us in with his narrative. And he and everyone else looks so modern and distinguished with Staples' updated look. They appear more realistic with a hint of resemblance to Saga's Marko and Alana. The art tells its own story in certain scenes, perfectly driving the plot with few words but brilliantly expressed with action and interaction of supporting characters. Archie refreshingly resists trying too hard to be "hipper" or forcibly relatable with modern technology or popular lingo. There are a lot of familiar names to go with some fresh faces. Betty and Jughead of course but there's also Kevin, Reggie, Maria, Sheila, Dilton, Raj, and others. They are well conceptualized with modern attire and colorful hair but without any snark or mean-spiritedness. The art team of Staples, colorists Andre Szymanowicz & Jen Vaughn, and letterer Jack Morelli have brought a fresh, vibrant and contemporary look to Riverdale. It's also without camp. Just a light-hearted approach with the soul of the Archie Comics we've known forever. It's full of sweet moments, funny moments, mixed with uncertainty and melodrama. It reminds me of the first season of Beverly Hills, 90210. You might scoff, but that show was a hit, full of drama and romantic entanglements. Not unlike our Riverdale friends. Anyway, Waid and Staples have exceeded expectations by bringing Archie into the 21st century with style, humor, and tons of heart. They have honored the sweet innocence of the series with a mature approach that is still fun and inviting. In fact, they've opened a whole new world ready to embraced by old and new fans alike. Archie #1 is off to a spectacular start and one of the best debuts of the year.